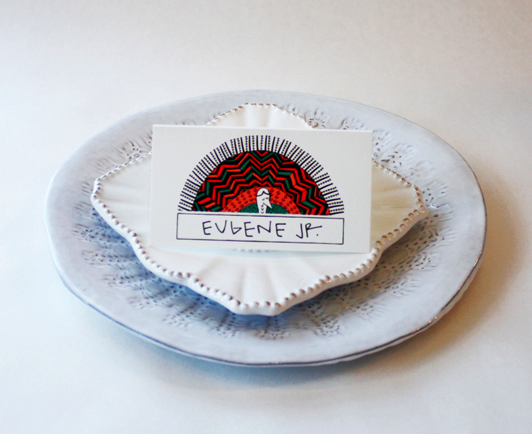 It's hard for me to resist anything resembling a paint fan deck. These wooden gift tags are in stock now at Anthro's Lenox Square location, and since I only needed six, I calculated that this set would cost me less than buying supplies to make my own. 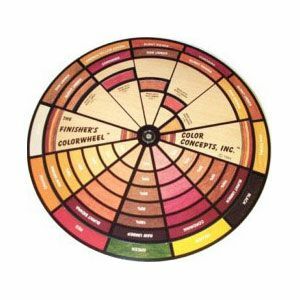 However, if you are game to do some experimenting, I spied this instructional wood finisher's color wheel at Highland Woodworking, directly across from the ever-so-helpful team at Paper Source, Virginia Highland. 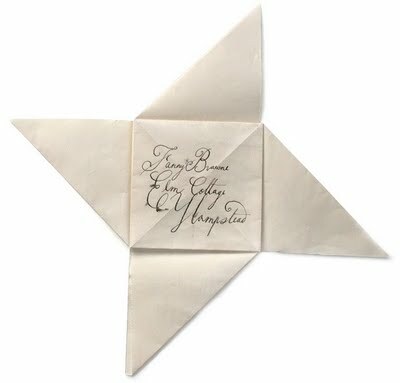 Not sure if I'll attempt any more Bright Star-esque paper-folding this season. 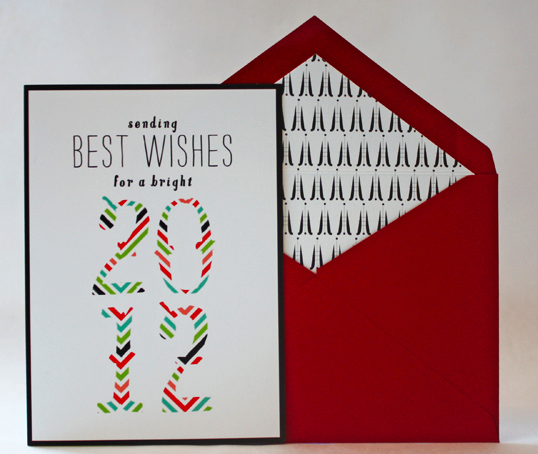 But I do like Mr. Boddington's Bright 2012 cards. 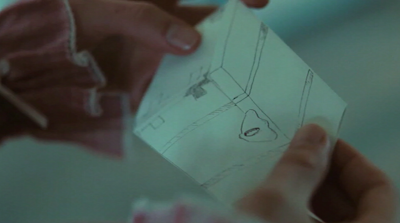 Note the hand-drawn zig-zags? 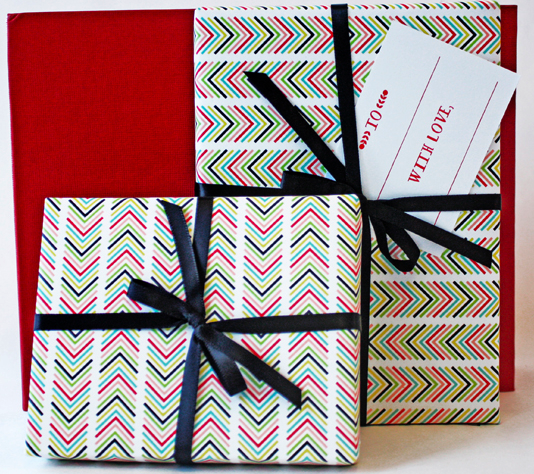 Multi-colored zig-zags appear in Boddington's gift wrap and place cards too. Love the pagoda-like 'Big John's Trees'. Apart from my fondness for the motif, the paper reminds me of my first cover story for Atlanta Intown, a piece about John Livaditis, that ran roughly a decade ago. At the Bard Graduate Center, greeting cards have taken center stage this fall with the exhibition, American Christmas Cards 1900-1960, on view through December 31, 2011 in the Focus Gallery. 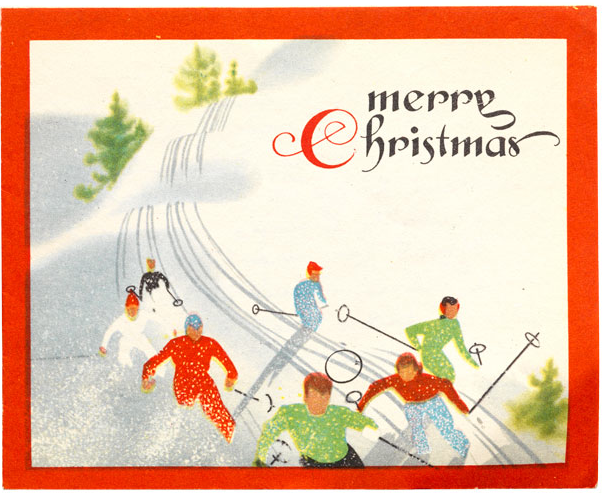 Although the images on 20th-century American Christmas cards speak volumes about a culture that changed rapidly in just a few decades, the genre has been mostly ignored in scholarly circles. 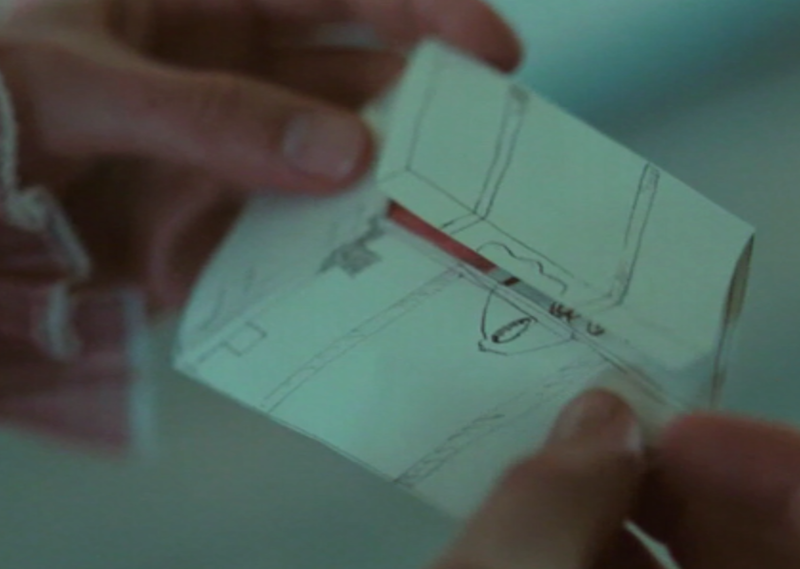 But this show, the first of it's kind, approaches the cards like artifacts. More than 20 categories of card imagery are explored. 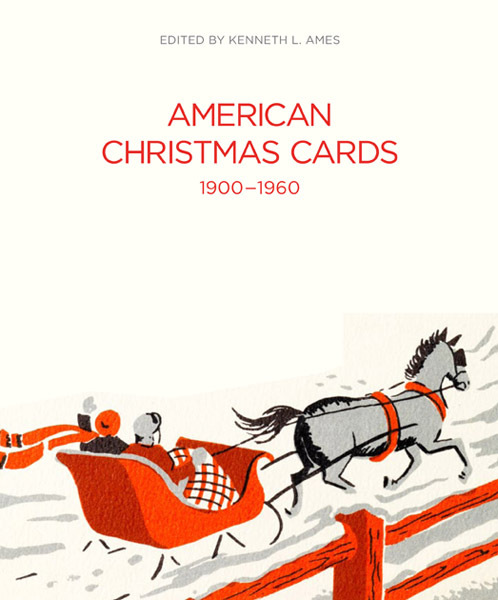 And there's an accompanying catalogue (or field guide to American Christmas cards, as the BGC describes it) available here. The midcentury examples are a lot of fun. 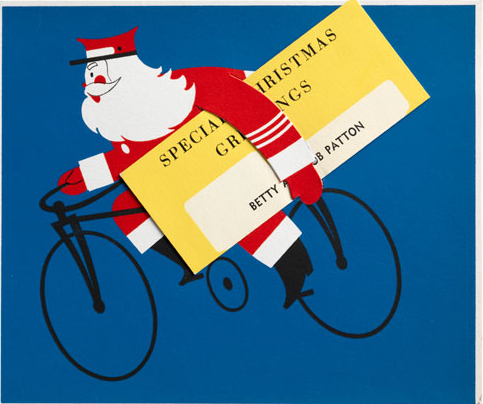 Above, a French-fold card with four-color process lithography on paper, sent in 1951, and made in the U.S.A. 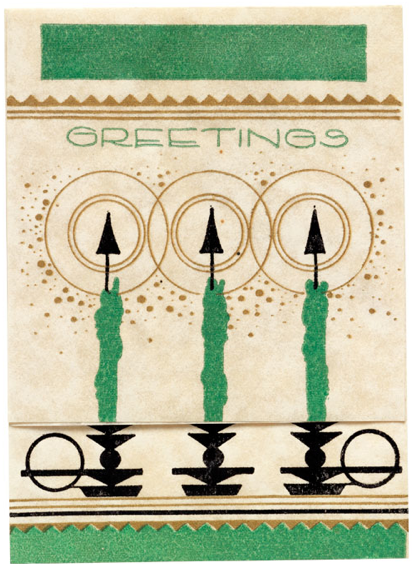 This crisp modified and augmented flat card features black and color lithography on cardstock with a white border and die-cut slots for an inserted letterpress greeting, circa 1950, Chryson’s, Hollywood, California. Modified French-fold card with green, black, and gold lithography on lightweight imitation parchment, short fold at bottom, circa 1935. Single-fold card with black photolithography on heavy paper, sent 1935, New York, New York, to Lynn, Massachusetts. All vintage card images via the Bard Graduate Center. I am not affiliated with or sponsored by any of the shops mentioned in this post. Just a fan. 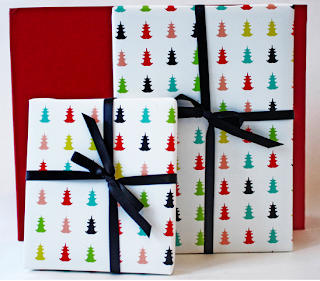 Thank you so much-- the book on Christmas cards is going to be a present to myself. 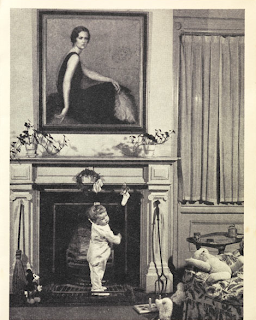 Even as a child I was fascinated by the art, and I'm looking forward to seeing the study.